There is something really special about that moment a mother first puts her newborn baby to her breast. A priceless moment filled with love. Though that moment really doesn't need anything extra, we're hosting a Mama Baby Love giveaway to make it even more special! We will outfit two mamas and their babies for their breastfeeding journey. 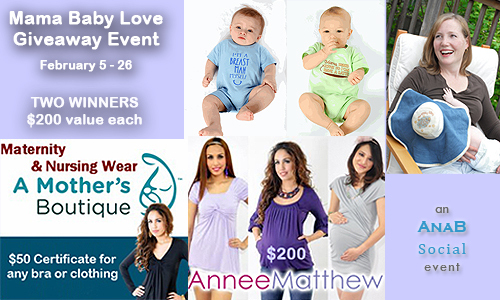 Thanks to our generous sponsors, you can win some gift certificates from Annee Matthew ($100 ea) and A Mother's Boutique ($50 ea) to use toward nursing apparel as well as a nursing hat from Moboleez and breastfeeding baby apparel for your little one from One Creative Mama. 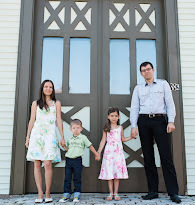 Annee Matthew nursing apparel has some of the most stylish nursing clothing on this planet! Purchase: You can shop Annee Matthew and A Mother's Boutique for a great selection of nursing bras and nursing apparel. They carry some of our favorite brands like Cake Lingerie, Bamboobies, and Bella Materna. You may also acquire a Moboleez hat and check out the adorable baby apparel from One Creative Mama (pictured below). Win The Package! Our sponsors are blessing two of you with the entire package as outlined above. Special thanks to AnaB Social for hosting this giveaway. Huge thanks to all participating bloggers as well! Giveaway ends February 27th at 12:01 am, open to US residents, ages 18+. To enter please use the Rafflecopter form below. Thank you! Disclaimer: AnaB Social, Eco-Babyz, and all participating event bloggers are not responsible for sponsor prize shipment. Nourishing Babies Since 100,000 B.C. Onesie is my favorite.